Ristorante Panorama is an authentic Italian, trattoria-style, “upscale casual” restaurant located on the lobby level of the Penn’s View Hotel. The cuisine is contemporary, authentic Italian with influence that leans toward the Northern Italian region and features homemade pastas, authentic veal dishes, and fresh seafood specialties. Lavish murals and decor provide a dramatic modern setting with traditional accents. The central focus is on the unique wine bar, with its custom-built, 120-bottle wine keeper. It is our mission to incorporate the full potential of an extensive “by the glass” wine system into an unforgettable dining and tasting experience for each guest. Twenty-seven wine tasting flights are our most distinctive offering, featuring over 150 wines available by the glass, in tasting flights, and by the bottle on the “everyday” wine list (sample wine list) which changes every week! Panorama offers four distinctly varied, yet complementary dining areas. 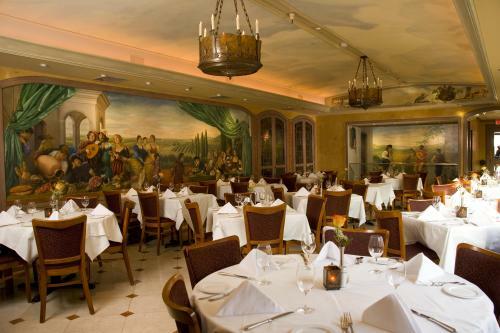 The Main Dining Room features original, Tuscan-inspired murals, stained glass windows, and comfortably sophisticated decor. 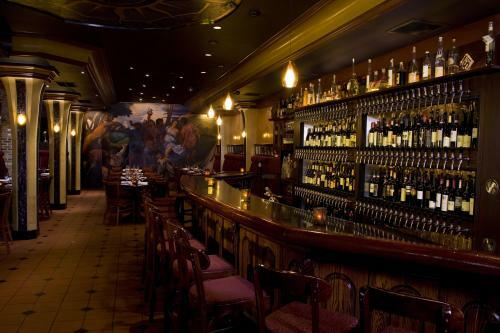 The romantic and seductive il bar wine bar features lavish velvet drapes, a reproduced mural of Titian’s Feast of Bacchus, torch lamps, and a dramatic wall of wine “on tap” behind the black granite bar. For private dining, the Stagione Banquet Room provides an elegant and sophisticated fine-dining style alternative to the enophile’s delight found in our intimate downstairs Wine Cellar dining room with its tantalizing view of our reserve selections.